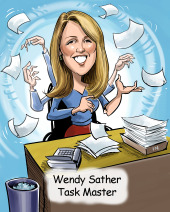 Wendy is a staff accountant with Summit CPA Group. Her concentration is on daily and weekly bookkeeping services, cash forecasting, preparing financial statements, and meeting customer needs. Wendy attended Milwaukee Area Technical College in the Dental Assisting Program. She spent twelve years in the dental field as a chair side assistant. For ten of those years she also served as Office Manager where she reconciled the books, handled accounts payable, payroll, and staff scheduling. Wendy and her husband, Jeff, originally from Wisconsin, currently reside in Fort Wayne with their three children. When she’s not at work, she is an avid tennis player and enjoys watching her children compete in hockey and tennis.